It's early afternoon on a glassy tropical ocean in 1798. You're a "jack tar" — an ordinary seaman on an English sailing vessel. You're on the watch, with little to do, because the sails are already set and the ship is nearly becalmed under a hot equatorial sun. Along with most of the rest of the watch, you're splicing sheets in the merciful shade of the mainsail. 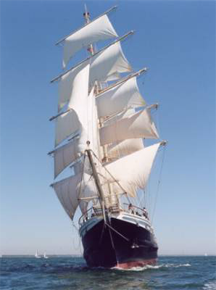 Tenacious under full sail. Photo courtesy Jubilee Sailing Trust, which "promotes the integration of able-bodied and physically disabled people through tall ship sailing adventures." Every minute or so, one of you looks over his shoulder at the smoking lamp. It's still out, but you expect the mate to order it lit at any moment. When that happens, you can light your pipe. Lighting the smoking lamp told sailors they could smoke. Smoking was generally dangerous on the deck of an eighteenth century vessel, because just about everything on board was flammable, and the tar they used to caulk seams was everywhere. Even an ember from a pipe could set it alight. Smoking was permitted only when the wind was light and favorable. In problem-solving organizations, we don't worry much about fire, but the tendency to jump into "solution mode" prematurely is just as dangerous, because most problems have multiple interacting causes. For instance, if a solution addresses one of the causes, and it fails, we might think that our solution didn't work, when actually it was necessary, but not sufficient. And some causes are active only when other causes are inactive. The bad behavior we observe when our trial solution is in effect might actually be due to a different failure mechanism. Even when we're just exploring a problem, we're easily deflected into solving it, which makes it difficult to focus on understanding rather than solving. One technique that helps is to use a "solving lamp," analogous to the sailor's smoking lamp. Get a Lava Lamp, or a flashlight that you can stand on end. Bring it to any meeting that you think might be vulnerable to falling into solution mode prematurely. Explain that during the parts of the meeting when the solving lamp is lit, we're looking for solutions, and when the solving lamp is out, we're doing something else. Would you like to see your comments posted here? rbrenOssAhsdOHJximQLIner@ChacLbuWxPAcGsnypavkoCanyon.comSend me your comments by email, or by Web form. I offer email and telephone coaching at both corporate and individual rates. Contact Rick for details at rbrenFHMOqqwzlOmapInbner@ChacxQMnJuVhLqNuifRWoCanyon.com or (650) 787-6475, or toll-free in the continental US at (866) 378-5470.